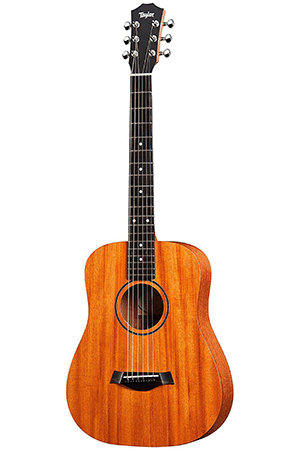 A dreadnought by the company that invented them, this acoustic-electric is a formidable choice, boasting Sapele wood's warm bright & warm profile. The dense Sapele wood adds a brightness to the warm, saturated mids & lows. The electronics reproduce the natural tone of the guitar faithfully. The pickup offers little in the way of tone shaping, but that can be done on the amplifier or with pedals if you're playing plugged in. From the acclaimed FG series, this solid top, full mahogany Dreadnought comes with your choice between 11 decorative finishes to match your style. The tone profile is strong in the mid-range & low-end, providing a lot of volume without overbearing high frequencies. Superior Yamaha construction. While not uncommon, the saddle, nut, & bridge pins are plastic. Can be changed if you take it in to a tech for a set-up, which is recommended if you can't do it yourself. This Dreadnaught made quite the splash when it debuted & remains a diamond in the rough of budget-priced guitars. This choice plays & sounds as good as most twice its price. The build quality is phenomenal, which includes binding & a handsome spalted maple top. While this is the best choice for beginners & budget-conscious buyers, some may question the uncommon combination of tonewoods for the top & sides. Starting to learn how to play guitar is one of the most exciting, but also most frustrating adventures you will encounter. There's so much stuff you need to pay attention to, techniques to learn, and theory to memorize. However, before you can even get to any of that, you will need to get yourself a guitar. Most experienced guitar players will tell you that an acoustic guitar is much better for beginners than an electric one. There are a couple of reasons why they are right. Acoustic guitars are often cheaper and require no additional gear in order to work. However, there's a more important reason why going acoustic is the way to go. Acoustic guitars are notorious for amplifying all and any mistakes you make. This gives you a clear idea of what you're doing right and what you're doing wrong. Selecting the right acoustic guitar for your needs and budget takes some planning and research. There are many models available, each with its own quirks, advantages, and flaws. As a beginner, you need a solid instrument that won't impede your progress in any significant way. Because of this, we have decided to put together a comprehensive guide that should help you find the best acoustic guitar for your needs. We will discuss what makes a decent acoustic and what you should pay attention to when choosing one and more. Later, we'll show you some of our top picks that we can recommend to both beginners and intermediate guitar players. With that said, let's get started. Selecting an acoustic guitar, especially your first one, is a process that requires you to apply reason, but also listen to your heart. No matter how cheesy this sounds, it's true. Let's cover some of the most important factors before we go into any further. 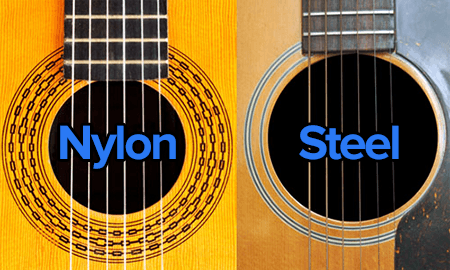 Steel String or Nylon String Guitars? 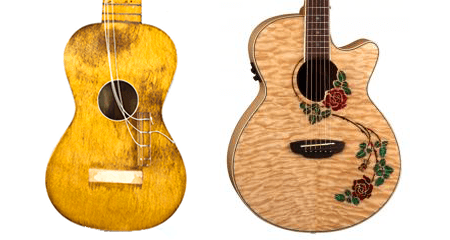 When it comes to acoustic guitars, we can divide them into two main categories. You got your steel string guitars, which is what most players like to use, while there are also nylon string models. The latter are generally more niche in nature, as they are used for specific genres of music. Nylon string guitars, or classical guitars as they are often called, are optimized for classical music and flamenco style. On top of that, this type of guitar is meant to be played with fingers in most cases. The reason why nylon string guitars are nowhere near as popular as their steel string cousins also has to do with their design. The issue here is that classical guitars have wider necks, meaning that a beginner will have a much harder time learning how to grip chords and similar. A steel string guitar comes with a narrow neck that eliminates this issue. One more point of difference is the tone of these two types of guitars. A classical guitar will have a much more mellow tone that is gentle and warm. On the other hand, a steel string will sound sharper but has more range in most cases. To put it in simple terms, if you plan on playing rock, pop, country or other popular genres of music, a steel string guitar is a proper way to go. In order to properly learn the basics of playing guitar, you will have to find a model that is comfortable. Comfort is by far one of the most important, yet most overlooked factors in choosing acoustic guitars. On a similar note, comfort is much more relevant to acoustics than it is to electric guitars. All of this has to do with how acoustic guitars work. What amplifiers do for electric guitars, acoustic guitars have to do on their own. This is the purpose of the resonator box. While it is convenient to have the instrument produce sound on its own, having to wrangle a resonator box can be pretty uncomfortable. Different people have different physical constitutions, which impacts their ability to play certain types of acoustic guitars. Luckily for us, the types of acoustic guitars come in a variety of shapes and sizes from the tiny travel guitars to full sized jumbos. One of the most popular guitar shapes you will run into is the Dreadnought. Overall, it is pretty neutral in a sense that it's not too big nor too small. However, an average Dreadnought will give you a decent tone profile thanks to its shallow waist. If you are in doubt about which size or shape of an acoustic guitar will work for you, chances are that any Dreadnought will be a good fit. Setting a budget for your first acoustic guitar is just one of those things that need to be done. There are several ways to go about doing this, depending on what your plans are in the future. Either way, investing some time into this step of the process will narrow down your choices to what works the best for you. The first piece of advice any experienced guitar player will give you on this subject is to get the best guitar your money can buy. In most cases, this approach works perfectly, but there are certain exceptions. When you are given this advice, it is implied that you will be playing guitar long term. In that case, getting the best guitar you possibly can indeed makes perfect sense. However, if you are still not sure whether or not playing guitar is something you will be doing for years to come, you need to adjust your budget. The market for acoustic guitars is divided into numerous price ranges that we cover below, giving you plenty of options. If you just want to dip your feet into these waters without making a substantial commitment, it is much better to get an entry level model. Are these guitars inherently bad? The answer is a definitive no. Some of the entry level acoustic guitars punch way above their price range. The only question is how long will this guitar serve you before you outgrow it in terms of skill and experience? That is something you'll figure out on your own as you take the journey. You can't know at what speed you'll learn and advance until you're doing it. 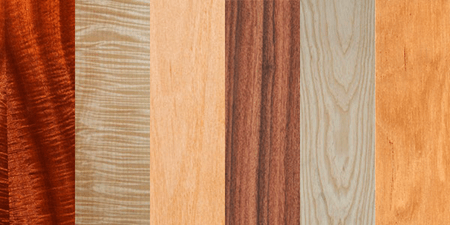 If you have read a bit about acoustics, you have probably heard that tonewood is an important factor that determines the quality of acoustic guitars. This is definitely true. As a beginner, you shouldn't be too worried about this topic, though. Here's why. The difference in tonewood generally has a subtle impact on the way your acoustic guitar sounds and plays. These differences are something that even a lot of more experienced players are not quite capable of recognizing. With that in mind, every modern entry level acoustic guitar will feature acceptable tonewood quality. You might not get the best tone quality, but you are guaranteed to get a guitar that you can use to learn how to play guitar very well. What is a lot more important is the overall build quality. This means how the guitar was put together, if the neck is aligned, how the bridge sits, and so forth. In other words, build quality is something that can slow down or otherwise impede your progress. Tonewood is a subject matter you should come back to when you know what kind of tone you like. Until then, try to get yourself a solid workhorse. When it comes to acoustic guitar brands, there are so many to choose from. With that said, the best thing you can do is to go with one that is known to build good instruments. Sure, there are lesser known brands that offer some great acoustic guitars. However, unless you have a very specific reason for getting their product, we recommend that you stick to the few larger, consistent names. One of the most popular misconceptions here is that you will pay extra just for the brand name. That isn't necessarily true. Fender, Epiphone, Gibson, and other manufacturers offer guitars which are more than reasonably priced. Also, most of these will have a good warranty system in place which will keep your investment safe. What most experts forget to tell you when giving advice about selecting an acoustic guitar, is that personal preference plays a major role. Think of it this way. If you get a guitar that makes you excited, you will want to pick it up and play it. That seemingly unimportant detail is one of the best driving factors behind learning how to play and staying motivated. Get a guitar that you find attractive, no matter what anyone else says. Chances are it will meet all other requirements as well. While acoustic axes need less gear than electrics, there are some accessories you'll have to have. Once you order your acoustic guitar and it gets dropped off at your doorstep, you will want to get some additional gear as well. We aren't talking about anything too expensive nor complicated. At the very least, you'll need a good set of picks, a strap, and some sort of soft gig bag or hard case. Picks are like socks and lighters - they tend to find a rift in space/time continuum and just disappear without a trace. This is one thing every guitar player has to deal with. The best thing to do is get more picks than you think are necessary. There are numerous value packs out there, which will work great. A good strap will prevent your instrument from being dropped. On top of that, it is recommended that you practice guitar while standing as much as possible. Lastly, guitar bags are there to protect your instrument while it's not in use. Learning to play guitar will sometimes bring you to the absolute edge of patience. You are essentially teaching your body a whole new level of fine motor skills. Doing this is anything but easy. We won't go too far into detail about where you should start as a beginner, but there is some advice that can benefit you in the beginning. Taking things slow is the best way to lay down a strong foundation for your future skills. It's easy to get lost in your favorite songs, trying your best to play them fast. However, that approach won't get you far. The importance of setting a manageable pace can't be emphasized enough. When you rush through exercises and techniques, you are essentially establishing bad habits. Those will be extremely hard to get rid off later on. Practice at a slow tempo until you can manage it without mistakes. The technique is an important part of playing guitar, however knowing the theory behind the music you are playing is crucial. Music theory is complex, takes the time to master and requires some actual studying. If you decide to commit your time to master it properly, you will have a much better understanding of music and how to write it. When you first start learning how to play, it's a great practice to also study the theory behind the technique you are working on at the moment. This way you are working with manageable chunks of information that won't overwhelm you. If there is one habit you should develop as soon as possible, it is proper guitar maintenance. Maintenance is not something you will hear being discussed too often, even though it is pretty important. Even more so if you own an acoustic guitar. We have written in detail about guitar maintenance, so we highly recommend that you check out that guide for more information on this subject. Okay, so we've covered everything you need to consider before making a decision. Let's jump into the fun part. What we're going to do is start in the middle range and work our way down to the most affordable. The first options represents your most costly but "best bang for your buck," because this is before you hit that part of the exponential curve of quality where the price starts out-pacing the benefits. This is the sweet spot. Then we slide down where you can spend a lot less and still get the most quality in that category (which is recommended for those who may not stay committed but still want to explore the world of guitar without a cruddy instrument). This price range hides some of the best acoustics on the market right now. We are talking optimal bang for the buck in terms of both quality and tone. Here are two that perfectly describe what we mean by this, more so than ones three times their going rate. Seagull is a Canadian brand that has made some serious shock waves on the market. This is especially true for the Seagull Artist Mosaic. You are looking at a hand-built guitar which is manufactured in North America by some of the best luthiers in the business. Not so long ago, owning an acoustic guitar that met these specs meant that you were spending several thousand on that instrument. Seagull and its parent company Godin essentially put an end to that. Now we can enjoy high-end build quality in an attainable price range. This is a Dreadnought style guitar with a solid cedar top. The back and sides are made of solid mahogany, giving you great sound projection and volume. In terms of build quality, this thing is a tank. Seagull has managed to design a guitar that offers performance that punches way above its category. The sound you can expect to hear is very well balanced across the range. Since it is a Dreadnought, there is going to be a lot of saturation in the mids, however, the Artist Mosaic also brings impressive clarity in the trebles. The lows are rich and well defined as well. Bang for the buck, this is one of the best options you can grab for less than a grand. 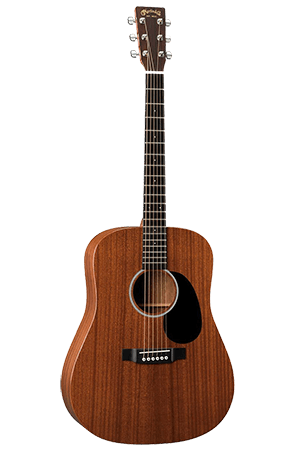 If there is one brand that knows how to make a Dreadnought acoustic, it is Martin. After all, they invented this type of guitar back at the beginning of 20th century. 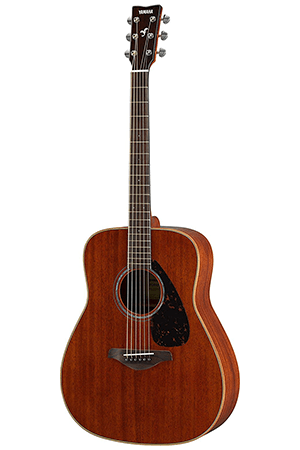 The one we are looking at today, the Martin Road Series DRS1, belongs to the acoustic-electric segment. Those who want to record music or perform life on stage will appreciate this for sure. Martin is known for their very specific choice of materials. The DRS1 comes with a solid Sapele top, Sapele back and sides as well as a select hardwood neck. Sapele has been the closest substitute for mahogany for a long time. By choosing it, Martin has shown that you can build a formidable acoustic guitar from this tonewood. In terms of electronics, you get the Fishman Sonitone package. Compared to other solutions on the market, you could say that this one is fairly low-profile. Thats good, and it does a great job at reproducing the natural tone of the Martin Road Series DRS1 in all of its beauty. Speaking of tone, this guitar offers a brighter but still warm profile. You get great saturation going all the way from lows into mids, while trebles are pretty crisp. Sapele is a fairly dense wood, which goes a long way in explaining the brighter response from this guitar. If you are looking for a versatile Dreadnought that you can use on and off the stage and be heard cutting through the noise and conversation, this is a model you need to check out. Moving down the price ladder, we reach the middle territory. This price bracket will get you some good performers. In all honesty, if you are a beginner who wants to get a solid acoustic guitar, one of these is going to be your best bet. Let's take a look at two awesome models and talk about what they bring to the table. 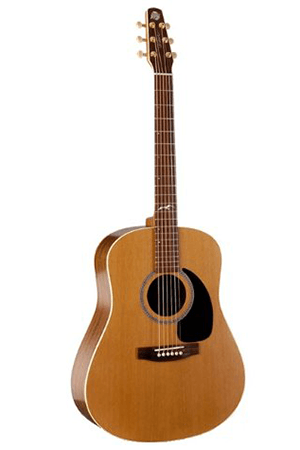 Yamaha's presence in the acoustic guitar segment has been one of the longest and most successful ones. Their FG series include the most sold acoustic guitars in history, and that says a lot. Today we are taking a look at one of the guitars from this family that goes by the name of the Yamaha FG850. All things considered, this is the king of the price range. What we have here is a Dreadnought made completely out of mahogany. That means solid top paired with solid back and sides. What truly sets this guitar apart from the competition is Yamaha's manufacturing process. This isn't a handmade instrument, but its level of craftsmanship is outstanding. That is something you will notice the moment you pick one of these up. The folks from Yamaha have also implemented their cutting-edge engineering technologies to give the FG850 a specific tone profile. This guitar is extremely strong in the lower and mid portions of the frequency range. That means a decent amount of volume and presence in a standard Dreadnought without overbearing crispy highs. The FG850 is offered in a variety of different finish options. From natural mahogany all the way to the several types of sunburst patterns, the choice is completely up to you. What matters the most is that Yamaha FG850 is definitely among the best acoustics you can grab at the moment. Taylor, along with Martin, are currently the two dominant brands of acoustic guitars. However, that doesn't mean you won't see budget guitars with their logo on the headstock. Case in point, the Taylor BT2 Baby Taylor. This guitar is a bit different from the other Dreadnoughts we have shown you today, but it is every bit as awesome. This model belongs to Taylor's compact series. BT2 Baby Taylor measures 3/4 the size of a regular Dreadnought. That doesn't have an impact on its performance, but what it does have an impact on is the comfort factor. Those who find it hard to play a standard Dreadnought will find this guitar to be much easier to wrangle. In terms of tonewood, Taylor compromised to reduce the price. We are looking at a mahogany solid top paired with laminate Sapele back and sides. More conservative players will find this to be somewhat disappointing, however, this guitar is rock solid as the newer all-Sapele models have been showing. The sound you get is pretty powerful for a 3/4 size Dreadnought. That has a lot to do with the way Taylor braced the whole thing, but also with the quality of the materials used. There is a decent amount of clarity in mids and trebles, while the lower end of the frequency range still packs a punch. And now we drop down a price tier again. These are solid beginner guitars that will serve you even as you evolve your skills and gain some experience. If you are not sure whether or not you want to commit to more expensive models, a $300-$400 guitar will get you the performance you need and allow you to learn and even master the instrument before committing to something ritzier. Let's check out our pick for this category. Gibson's Hummingbird is one of the most legendary acoustic guitars ever made. Epiphone, as the top source of more affordable versions of Gibson guitars, has decided to bring this model back. The Epiphone Hummingbird Pro features a very solid build quality paired with great materials and an awesome but basic set of electronics. One look at this guitar and you can already tell that Epiphone went for a more vintage vibe. 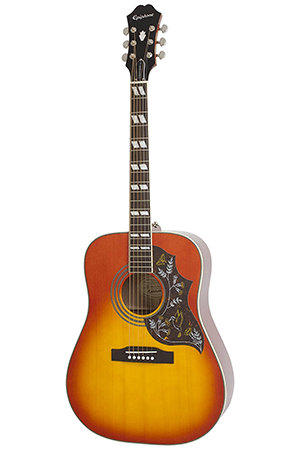 This is a Dreadnought with a nice looking sunburst finish as well as a decorated pickguard. The top wood is a solid spruce piece that is complemented by mahogany back and sides. Overall, this a very standard combination of tonewood, and one that has proven its worth numerous times. What is really impressive is the level of detail on the Hummingbird Pro, from the pickguard we have just mentioned, to the bound fretboard and vintage looking fret inlays. If you didn't know exactly what you were looking at, chances are you would mistake this guitar for one twice as much, easily. In terms of sound, the Hummingbird delivers a very balanced performance that leaves nothing to chance. There is enough warmth where necessary, but also brightness in the upper part of the frequency range. On top of that, the hardware does its job rather well. You don't have to worry about it slipping and dropping out of tune. For what it is, Epiphone's Hummingbird Pro is by far one of the best options for budget buyers. This segment of the market is not all that popular, but it hides some of the least known gems out there. We are going to show you one such guitar that offers great performance at a great price. Those looking for a solid affordable acoustic should absolutely check this out. Oscar Schmidt is a brand that doesn't have even a portion of reputation most of the brands we've named so far do. Which is humorous, because their Oscar Schmidt OG2SM managed to create quite a commotion when it first appeared. It's still holding on as the contender for beginners and low budgets. This odd looking acoustic has shown to perform much better than anyone could have expected. Because of that, it is the absolute best model in its price range. 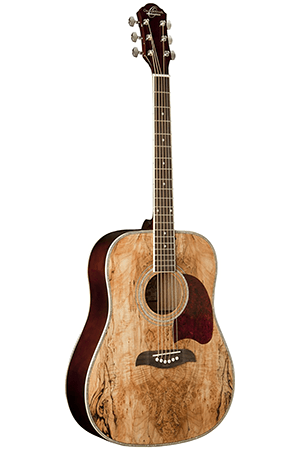 We are looking at a standard Dreadnought that features a spalted maple top combined with catalpa back and sides. Right off the bat, it's no secret that these tonewoods aren't really the most common choice. But on the other hand, they seemed to have worked rather well. One aspect of OG2SM that has really blown away a lot of users is the build quality and appearance. The OG2SM looks impressive with its bound top and fretboard. Not to mention the spalting effect on the top. These guitars are well put together, showing a very small amount of errors in craftsmanship compared to other companies' runs. In fact, you would be hard pressed to find one even if you looked really hard for hours with a magnifying glass. What really came as a surprise was the tone. The OG2SM behaves and sounds every bit as good as some dreadnoughts a couple of price ranges up to the ladder. In other words, this guitar is a true hidden gem of the market. As such, it represents the best possible choice for someone who doesn't want to go higher or can't afford a high-priced acoustic guitar. Lastly, we need to take a look at some of the most affordable guitars on the market. This is where you need to be really cautious and recognize what works and what doesn't. Fortunately for us, there are some solutions that are reliable. One such guitar is Gibson's Maestro travel guitar. This thing will cost you less than people have paid for a guitar strap and will still offer a rather decent performance. Gibson is definitely not a brand that is usually associated with affordable instruments of any kind. But even with luxury brands there are always exceptions to the rule. Even though this guitar is technically made by a subdivision of Gibson, it still bears their logo on the headstock. None of that really matters. What does matter here is the performance you get for your dollar. 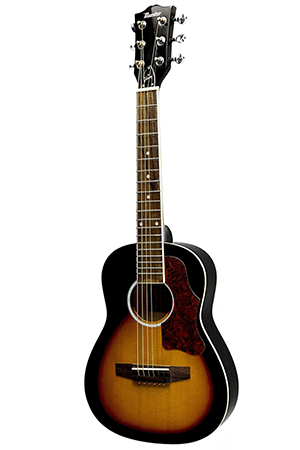 The first thing you need to know about the Gibson Maestro is that it's a 7/8 size compared to a standard acoustic guitar. This is what you call parlor or travel guitars. On top of having a smaller body, parlor guitars also come with a shorter scale. This also applies to Maestro. Overall, its smaller size makes it easier to play for users with smaller hands as well as kids. The choice of tonewood on Maestro is fairly decent. You are looking at a spruce top paired with kauri back and sides. Again, not a common combination but one that works nonetheless. In terms of tone, Maestro delivers a slightly brighter sound with the accent being on the trebles and mids. That is perfectly normal for travel guitars as their lower bouts are smaller in size. Overall, this is a great guitar for anyone who wants to get a cheap acoustic model. This awesome little Gibson concludes our guide. By the time you are reading this, you should have a fairly good surface understanding of what makes a great acoustic guitar and how to choose one that fits your needs. The models we have shown you above are our personal top picks for each category. We tried to select guitars that are proven, reliable, and offer good value for the money. As always, we encourage you to do additional research on this subject and learn as much as you can. Learning to play guitar might not be the easiest thing in the world, but you will soon find out just how awesome it is. Lastly, just remember to have fun. After all, that is what it's all about. 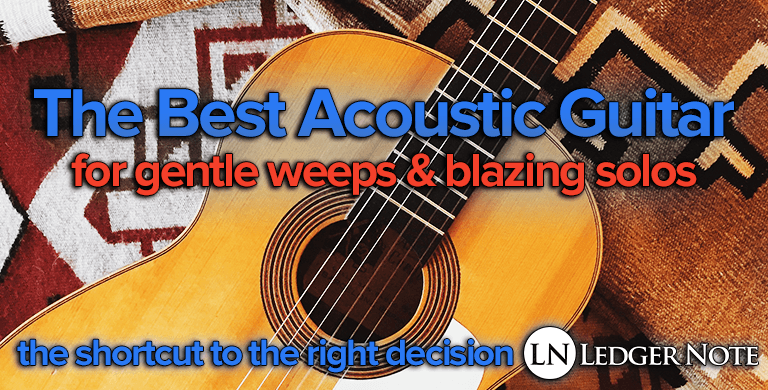 We hope you’ve enjoyed our guide on finding the best acoustic guitar to match your needs. Feel free to leave any comments you might have on our social pages or hit those share buttons if you're up for it; when the line is drawn, it is your feedback that fuels our passion for writing. Rock on, folks, and thanks again for taking the ride!